Here’s a quick bite-sized post for you all, just in time for Friday. Our workplace decided to step up their game and teach employees some toilet etiquette. Taking issue with their phrasing I decided to create this half-assed home-made meme. What else am I going to do at work on a Friday? Work?! Yes, I do have too much time on my hands. Thanks for asking. This is great… I’m gonna have to put a sign up at work because our toilet is nasty. Seriously, poo everywhere. Ha, ours can get quite disgusting too, so the sign is well intentioned. Doesn’t mean I can’t mess with it a bit! “Please use the toilet brush is necessary.” That’s like cleaning up your splattered mess in the microwave. Just common courtesy to fellow co-workers. Too funny. If I’d read that sign, I would not have realized that it could have its meaning construed like that. I would have just thought, okay, towels in bins. You, however, seem to have a knack for seeing this which makes for a lot of very funny posts. I’m going to start looking at signs closer. What’s the fun in understanding the meaning of a sign, when you can misinterpret it in the most contrived way possible, right? 😉 Happy Saturday! My kind of Friday post. 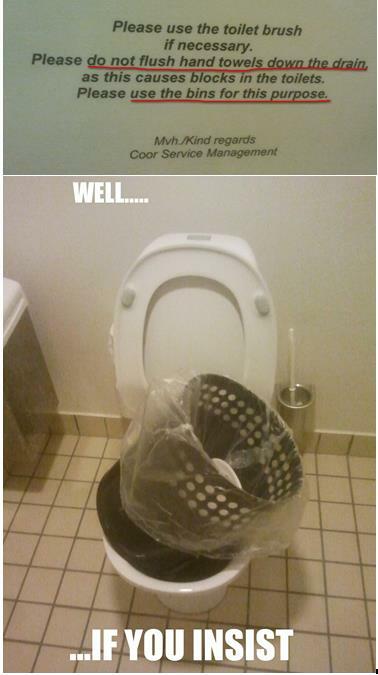 You really showed that toilet who’s boss! That’s right, I don’t mess around! Actually…yeah…that’s exactly what I do, clearly! Happy Friday! Ha! I guess I like potty humor. Have a good weekend yourself.